PDB rendering based on 1zk9. 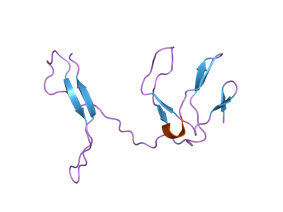 Transcription factor RelB is a protein that in humans is encoded by the RELB gene. RELB has been shown to interact with NFKB2, NFKB1, and C22orf25. Taylor JP, Pomerantz R, Bagasra O, et al. (1992). "TAR-independent transactivation by Tat in cells derived from the CNS: a novel mechanism of HIV-1 gene regulation". EMBO J. 11 (9): 3395–403. Ruben SM, Klement JF, Coleman TA, et al. (1992). "I-Rel: a novel rel-related protein that inhibits NF-kappa B transcriptional activity". Genes Dev. 6 (5): 745–60. Liu J, Perkins ND, Schmid RM, Nabel GJ (1992). "Specific NF-kappa B subunits act in concert with Tat to stimulate human immunodeficiency virus type 1 transcription". J. Virol. 66 (6): 3883–7. Biswas DK, Salas TR, Wang F, et al. (1996). "A Tat-induced auto-up-regulatory loop for superactivation of the human immunodeficiency virus type 1 promoter". J. Virol. 69 (12): 7437–44. Jeang KT, Chun R, Lin NH, et al. (1993). "In vitro and in vivo binding of human immunodeficiency virus type 1 Tat protein and Sp1 transcription factor". J. Virol. 67 (10): 6224–33. Alcamí J, Laín de Lera T, Folgueira L, et al. (1995). "Absolute dependence on kappa B responsive elements for initiation and Tat-mediated amplification of HIV transcription in blood CD4 T lymphocytes". EMBO J. 14 (7): 1552–60. Majello B, De Luca P, Hagen G, et al. (1995). "Different members of the Sp1 multigene family exert opposite transcriptional regulation of the long terminal repeat of HIV-1". Nucleic Acids Res. 22 (23): 4914–21. Taylor JP, Pomerantz RJ, Oakes JW, et al. (1995). "A CNS-enriched factor that binds to NF-kappa B and is required for interaction with HIV-1 tat". 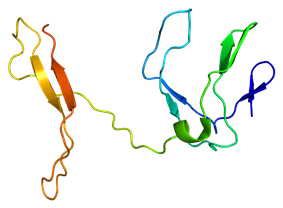 Oncogene 10 (2): 395–400. Westendorp MO, Shatrov VA, Schulze-Osthoff K, et al. (1995). "HIV-1 Tat potentiates TNF-induced NF-kappa B activation and cytotoxicity by altering the cellular redox state". EMBO J. 14 (3): 546–54. Scala G, Ruocco MR, Ambrosino C, et al. (1994). "The expression of the interleukin 6 gene is induced by the human immunodeficiency virus 1 TAT protein". J. Exp. Med. 179 (3): 961–71. Bours V, Azarenko V, Dejardin E, Siebenlist U (1994). "Human RelB (I-Rel) functions as a kappa B site-dependent transactivating member of the family of Rel-related proteins". Oncogene 9 (6): 1699–702. Deloukas P, Dauwerse JG, van Ommen GJ, van Loon AP (1994). "The human NFKB3 gene encoding the p65 subunit of transcription factor NF-kappa B is located on chromosome 11q12". Genomics 19 (3): 592–4. Westendorp MO, Li-Weber M, Frank RW, Krammer PH (1994). "Human immunodeficiency virus type 1 Tat upregulates interleukin-2 secretion in activated T cells". J. Virol. 68 (7): 4177–85. Dobrzanski P, Ryseck RP, Bravo R (1993). "Both N- and C-terminal domains of RelB are required for full transactivation: role of the N-terminal leucine zipper-like motif". Mol. Cell. Biol. 13 (3): 1572–82. Harhaj E, Blaney J, Millhouse S, Sun SC (1996). "Differential effects of I kappa B molecules on Tat-mediated transactivation of HIV-1 LTR". Virology 216 (1): 284–7. Conant K, Ma M, Nath A, Major EO (1996). "Extracellular human immunodeficiency virus type 1 Tat protein is associated with an increase in both NF-kappa B binding and protein kinase C activity in primary human astrocytes". J. Virol. 70 (3): 1384–9. Demarchi F, d'Adda di Fagagna F, Falaschi A, Giacca M (1996). "Activation of transcription factor NF-kappaB by the Tat protein of human immunodeficiency virus type 1". J. Virol. 70 (7): 4427–37. Beauparlant P, Kwon H, Clarke M, et al. (1996). "Transdominant mutants of I kappa B alpha block Tat-tumor necrosis factor synergistic activation of human immunodeficiency virus type 1 gene expression and virus multiplication". J. Virol. 70 (9): 5777–85. Ramazzotti E, Vignoli M, Re MC, et al. (1996). "Enhanced nuclear factor-kappa B activation induced by tumour necrosis factor-alpha in stably tat-transfected cells is associated with the presence of cell-surface-bound Tat protein". AIDS 10 (5): 455–61. ^ Bours V, Burd PR, Brown K, Villalobos J, Park S, Ryseck RP, Bravo R, Kelly K, Siebenlist U (Feb 1992). "A novel mitogen-inducible gene product related to p50/p105-NF-kappa B participates in transactivation through a kappa B site". Mol Cell Biol 12 (2): 685–95. ^ a b Bouwmeester, Tewis; Bauch Angela, Ruffner Heinz, Angrand Pierre-Olivier, Bergamini Giovanna, Croughton Karen, Cruciat Cristina, Eberhard Dirk, Gagneur Julien, Ghidelli Sonja, Hopf Carsten, Huhse Bettina, Mangano Raffaella, Michon Anne-Marie, Schirle Markus, Schlegl Judith, Schwab Markus, Stein Martin A, Bauer Andreas, Casari Georg, Drewes Gerard, Gavin Anne-Claude, Jackson David B, Joberty Gerard, Neubauer Gitte, Rick Jens, Kuster Bernhard, Superti-Furga Giulio (Feb 2004). "A physical and functional map of the human TNF-alpha/NF-kappa B signal transduction pathway". Nat. Cell Biol. (England) 6 (2): 97–105. ^ Thornburg, Natalie J; Pathmanathan Rajadurai, Raab-Traub Nancy (Dec 2003). "Activation of nuclear factor-kappaB p50 homodimer/Bcl-3 complexes in nasopharyngeal carcinoma". Cancer Res. (United States) 63 (23): 8293–301.